A couple of years ago, I had a meeting with an advertising executive at Reynard, Andrew Tarlow’s restaurant in the Wythe Hotel. The executive — a self-proclaimed gym rat with a flair for bragging — ordered and ate a beautifully marbled 24-ounce steak, despite the fact that this was neither a lunch nor dinner meeting. 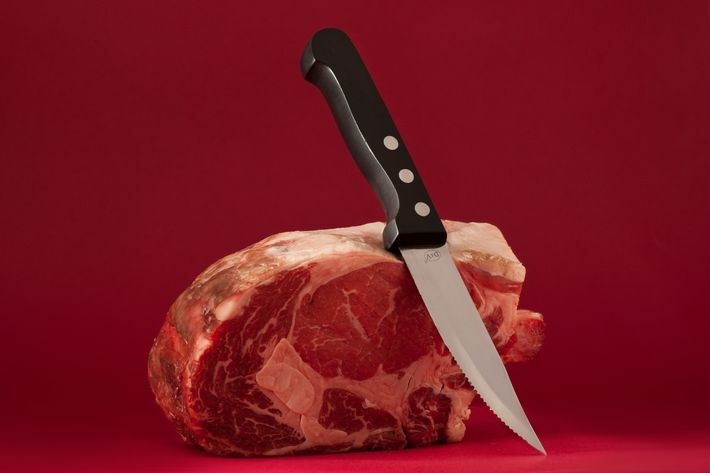 Between bites, he told me about a monthlong contest he’d begun with a friend: steal as many steak knives from as many New York City restaurants as possible. With a sturdy wooden handle and a double-wide steel blade, Reynard’s knife was, much like this executive’s ego, hard to ignore. In fact, the best restaurant steak knives, much like the best steaks, announce themselves at a table. 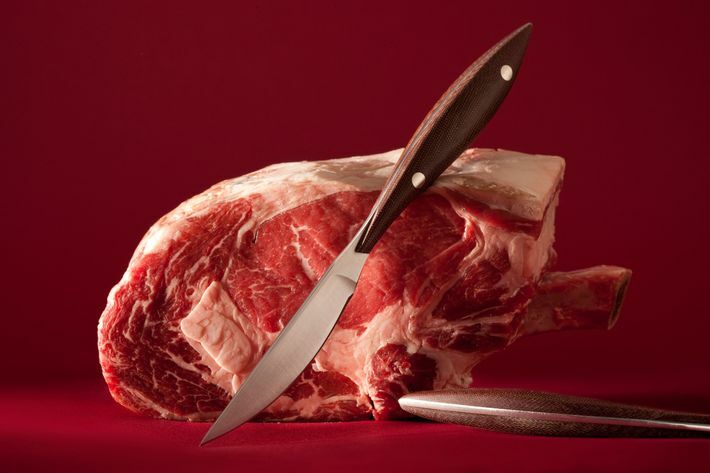 The oversize flatware needs to hold its own alongside the huge slabs of beef that are currently on offer in New York. 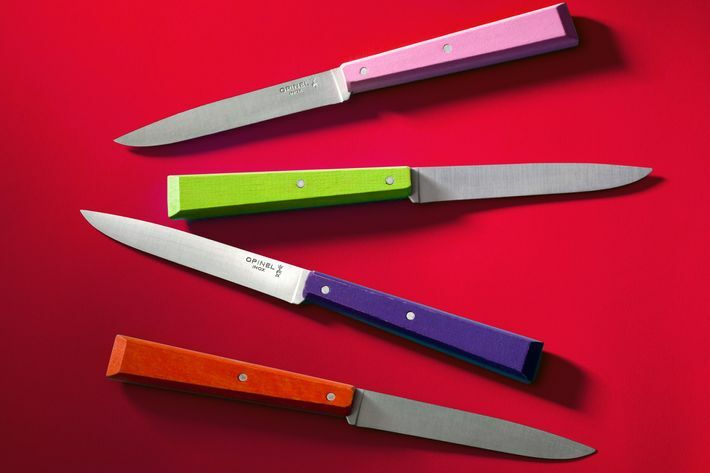 And the so-called “full-tang” knife — one where the blade itself extends into the handle, making it sturdier and, thus, better for slicing through a monster rib eye — from Reynard is just one example of the increasingly colossal, colorful procession of knives found throughout New York City these days. 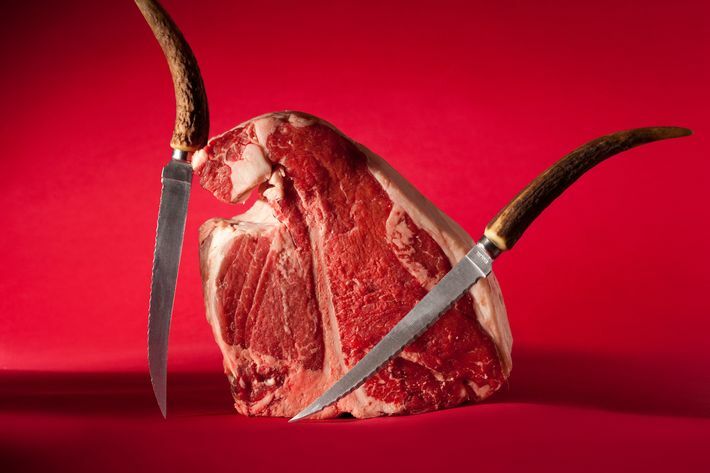 After all, any place serving a 32-ounce, dry-aged côte de boeuf needs to consider the corresponding cutlery. 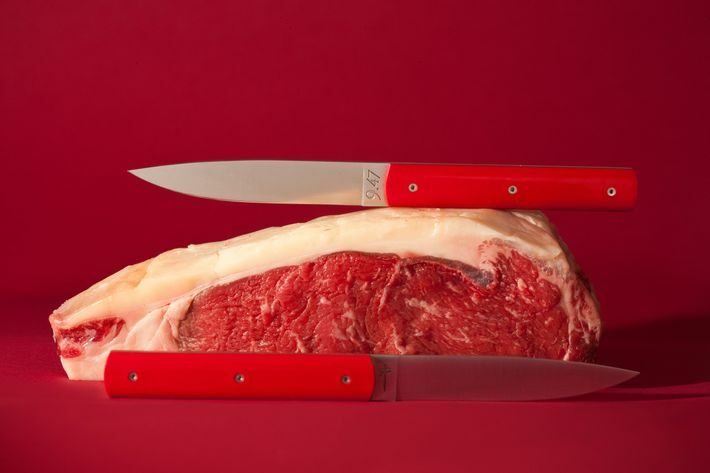 “Most steakhouses, in order to have a sharp knife, use a serrated edge,” says chef Michael White, whose most recent restaurant, a French brasserie called Vaucluse, offers a non-serrated, silver-handled Degrenne Florencia blade. 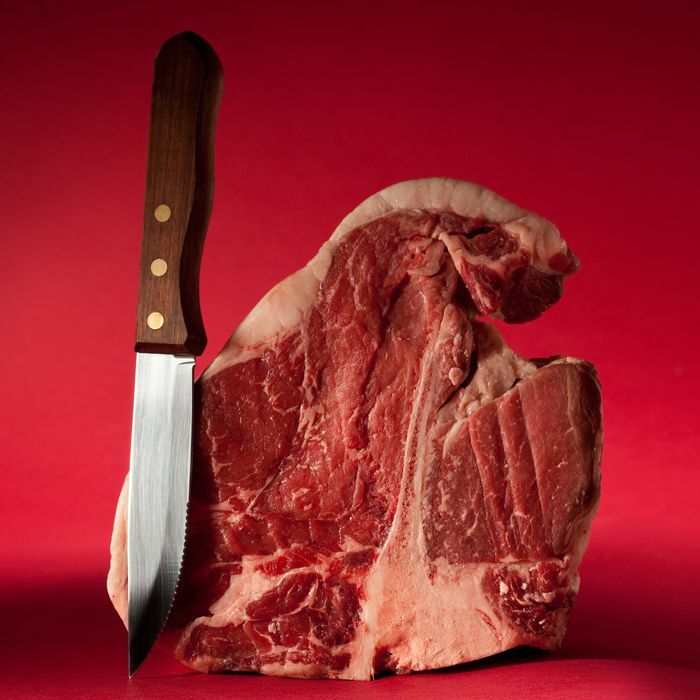 “The problem is that serration rips the meat, and the fibers bleed. 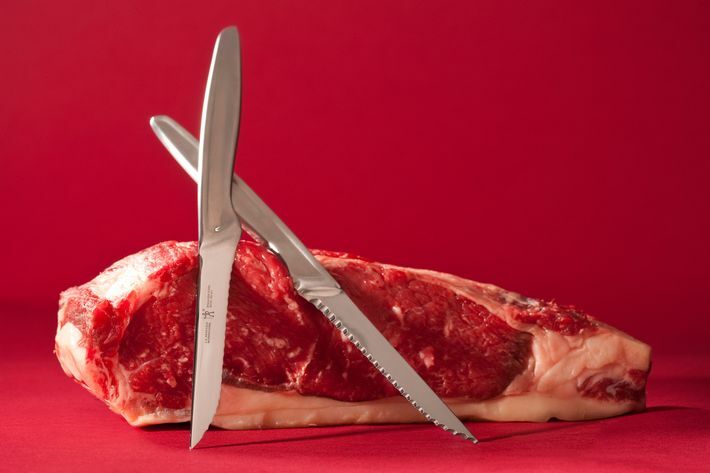 When you use a really sharp, smooth knife, it maintains the natural texture,” he says. White’s restaurants are sticklers for good knives; Osteria Morini stocks a weighty piece with a buffalo-horn handle from Italian knife-maker Saladini (a little over $100 apiece for home cooks). Of course, there will be those who insist on adorning the table differently. Take, for instance, Stephen Starr’s Clocktower, a club-ish den where dangerously curved 13-inch sabers are borne by handles carved from roughhewn buck antlers. And then there are the showgirl-flashy Laguiole knives at Dirty French. Available in colors like Mediterranean blue, bright pink, and lime green, they’re emblazoned with the clubby restaurant’s signature script, and they’re every bit as ostentatious as the menu’s “market price” côte de boeuf that runs from $100 to $250. Dirty French isn’t the only restaurant where the standard approach to prestige cutlery — “more is more” — is being rethought. 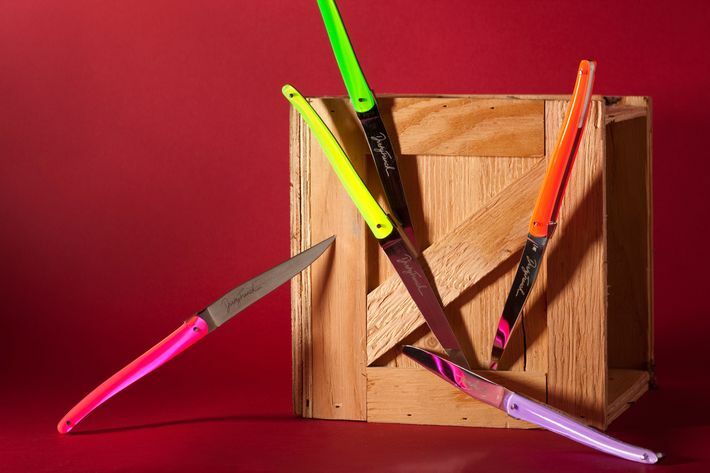 Williamsburg’s Four Horsemen — which counts LCD Soundsystem’s James Murphy among the partners — also breaks out DayGlo-bright knives (theirs come from Opinel.) 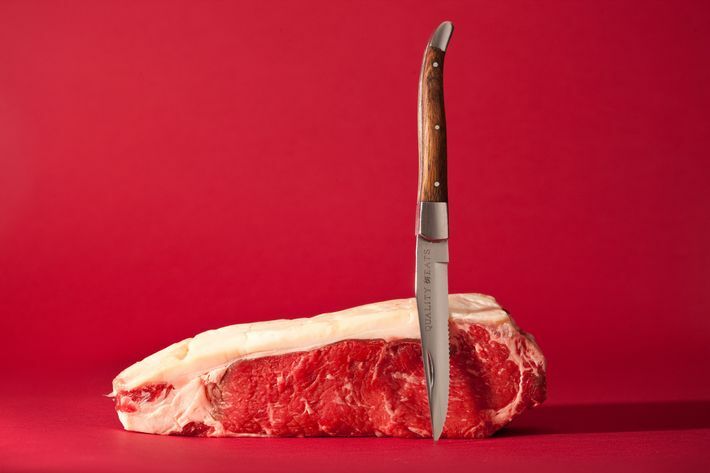 And at Quality Eats in the West Village, restaurateur Michael Stillman considers the steak knife to be the single most strategic decision a steakhouse can make: “The steak knife literally drives the guests’ perception of the quality of the steak.” He first opted for a new-to-market model, the Stratus Culinary Recurve, which boasts a reverse scallop tip, an innovation that supposedly accommodates a clean cut. He has since changed them and now offers guests the Fortessa Provencal serrated knife sporting the restaurant’s logo. 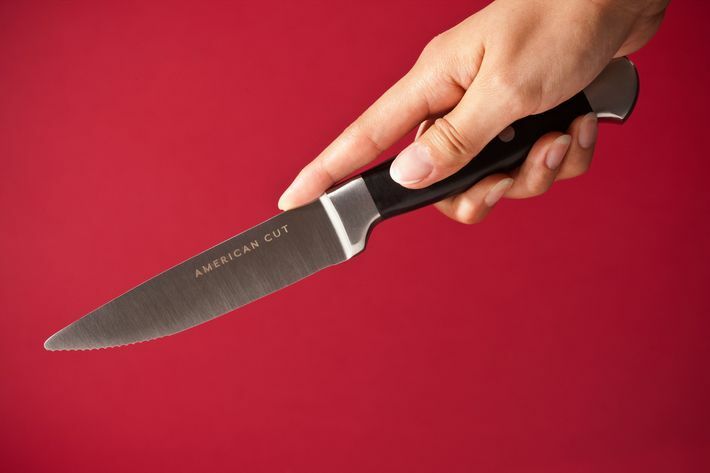 “We tried to get cutesy with other knives, but at the end of the day, a nice big steak knife is good for all sizes of cuts and hands,” says chef Marc Forgione. 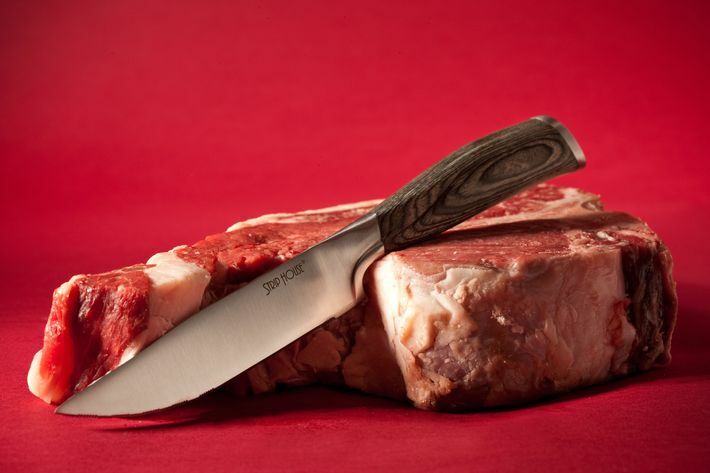 His bells-and-whistles-free Tramontina Porterhouse knives are an everyman ideal, and make quick work of a 30-day dry-aged strip steak’s craggy, stippled surface. The same can be said of Keith McNally’s restaurants Minetta Tavern and Cherche Midi, which employ trusty, discreet — yet substantial — serrated blades and chunky wooden handles. 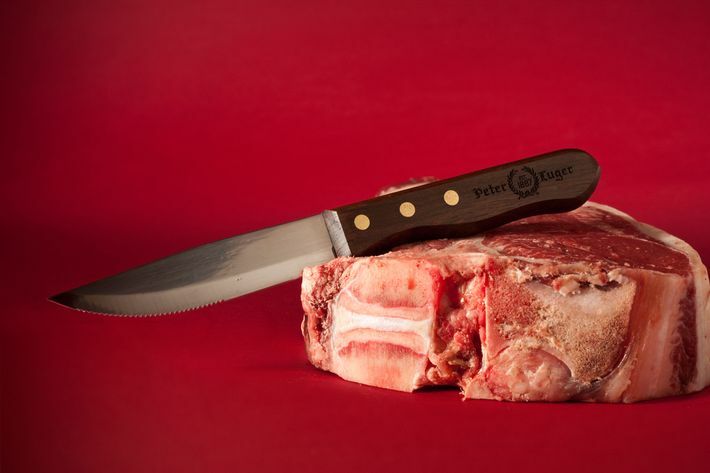 Steak stalwart Peter Luger, in keeping with its reputation as the classic New York City steakhouse, offers a similar (branded) version, and sells sets on its website. Until recently, there was still one well-known knife I hadn’t come across in New York, something that could be likened to the Birkin bag of cutlery: the Perceval 9.47. Created by Michelin-starred chef Yves Charles in Paris, these airy, unassuming pieces strike a graceful note of function and beauty. Small, subtle, and for sale in a variety of colors, the Perceval 9.47 is something that isn’t usually available to everyday diners. They have, however, appeared at Pasquale Jones, the new Little Italy restaurant from the team behind Charlie Bird, where the non-serrated blades glide through wood-roasted steaks and pork shanks for two. And it all happens under the very watchful eyes of the staff, seeing as how the highly covetable, very delicate knives might have a tendency to disappear into the pockets of meat eaters, or advertising executives, with a habit of stealing bright, shiny objects.